This blog is part of a series to coincide with A Promise Renewed in the Americas: ”Reducing Inequalities in Reproductive, Maternal and Child Health Summit,“ that was held during September 10-12 in Panama. Why convene this meeting in the first place? In 2015, most LAC countries will meet Millennium Development Goal (MDG) 4 (child health), and many will meet MDG 5 (maternal health.) However, it is certainly too early to declare victory in maternal and child health in LAC. Some countries will not meet either MDG 4 or 5, and Haiti’s indicators will fall considerably short of its goals. Moreover, averaged, national-level statistics mask major inequalities in maternal and child health in almost all countries in the region. And, the groups with much-worse-than-average health outcomes – most notably in maternal and neonatal deaths – are LAC’s most vulnerable and marginalized populations. Often these are also people whose voice is not heard in policy-making. Further, as outlined in an article for the Journal de Perinatología y Reproduccion Humana, the pace of progress in reducing preventable maternal, child, and newborn deaths has slowed considerably throughout the region. At the same time, the investment of international donors in the health sector in LAC has declined markedly over the last two decades. So, the capacity and resources of the region itself will have to be better focused to reduce its major “equity gaps” in maternal and child health. 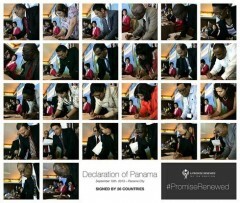 In this context, the Panama conference was initiated by USAID’s Bureau for Latin America and the Caribbean, and sponsored by a consortium of donor agencies, USAID, PAHO/WHO, UNICEF, UNFPA, UNAIDS, the Inter-American Development Bank, and the World Bank, to catalyze a more concerted regional effort to address those gaps. So, why now? In addition to the convergence of the region-specific factors just mentioned, the timing of the Panama conference was important in a global context because it forged a link between the Latin America and Caribbean region and the new global movement “A Promise Renewed” (APR). That movement was launched in June 2012 at the Child Survival Call to Action event in Washington, D.C. that was hosted by the governments of Ethiopia, India, and the United States, in collaboration with UNICEF. APR aims to re-energize those working on maternal and child health world-wide, and increase attention and investments toward the goal of ending preventable maternal and child deaths within the next generation – by 2035. Several follow-up conferences in Africa and Asia have helped sub-regions and individual countries to begin development of detailed roadmaps to reach this goal. For the LAC region, reaching the global goal will require a fundamental commitment to bridging equity gaps. Going forward, we expect that LAC’s active participation in the global APR platform will lead to accelerated learning and better metrics for gauging progress. What’s ahead? A major consensus emerging from the conference was that the true locus of control for closing these equity gaps lies in the countries of the region –their governments, civil society, academies, churches, and other institutions. The appropriate role for donor agencies is supportive, not primary, in setting goals, timelines, the route to reach them, and the metrics to measure them. Many conference participants called for a regional mechanism to help facilitate collaboration, information exchange, south-to-south sharing, and access to technical expertise to accelerate the reduction of inequities. Conferees identified key principles to guide efforts to close equity gaps, among them: use of cross-sectoral approaches for multi-sectoral problems; a focus on marginalized populations (rather than expecting benefits to trickle-down); use of multicultural approaches; and promotion of gender awareness. Conferees supported the establishment of a regional network dedicated to addressing health equity gaps, which would be open to countries, civil society, private sector, and international agencies. Representatives from several countries indicated that they would initiate national, and potentially sub-national, meetings to address maternal, child and adolescent health inequities in their own countries. The donor consortium agreed to continue support for the A Promise Renewed for the Americas website, to serve as a platform for virtual discussion and planning, an information repository, and mechanism for technical interchange. Conferees provided ideas orally and in writing for a regional framework aimed at supporting country progress on reducing inequities. This framework, along with a limited organizational structure, will continue to be developed in the coming months, with modest funding from the seven-agency donor consortium. Setting of region-wide goals for reduction of health inequities was deferred, given the diversity of circumstances and the lack of standardized data across the region that could help inform policies and decision making. There was also general agreement that imposing regional, uniform, health equity reporting requirements on countries would not be feasible or desirable at this point. However, it was widely agreed that gauging progress in reducing health inequities is essential for accountability. That will require countries to disaggregate their health data to allow analysis by geographic, economic, ethnic, and gender variables, over time. Conferees also stressed the importance of LAC participation in shaping the post-MDG 2015 health development agenda.